As I waited on the Lord, I saw a broken, divided heart held tenderly in His hands. Water began to flow from the bottom of the heart, not from the overflow. 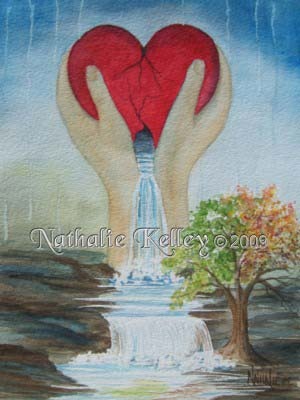 It felt as if all that was left was being poured out but from that release came a beautiful, life giving waterfall. It was a new start. It flowed down, pooled and flowed down again. The water flowed over rocks and rough places. But, it continued to flow. Growing beside the river was a tree that displayed all four seasons of life: spring (freshness and new life), summer (growth and peak), autumn (maturity and harvest), winter (barren and finished). In all of the stages, even in winter, the tree is alive. Ezekiel 11:19 I will give them an undivided heart and put a new spirit in them; I will remove from them their heart of stone and give them a heart of flesh. Ezekiel. 36:25-27 I will sprinkle clean water on you, and you will be clean; I will cleanse you from all your impurities and from all your idols. I will give you a new heart and put a new spirit in you; I will remove from you your heart of stone and give you a heart of flesh. And I will put my Spirit in you and move you to follow my decrees and be careful to keep my laws.